Explore the mysterious world of the ancient Maya! Put your puzzle skills to the test, gather clues, and solve the mystery in this hands-on archaeological adventure. 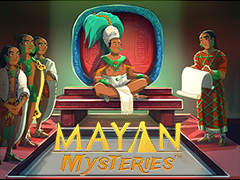 Explore Maya pyramids, investigate the Mayan calendar, excavate priceless artifacts, and travel back in time to explore Maya cities as you track down the mysterious Ladrone. Will you be the one to locate the mythical city of Ich’aak, revealed only to those with pure hearts and the knowledge to protect the artifacts, sites and culture of the Maya? The adventure awaits!